This report provides guidance on how to establish nationally appropriate mitigation actions (NAMAs) across different sectors in Indonesia. It outlines the key steps when establishing NAMAs towards a multi-sectoral GHG mitigation framework. Key steps comprise the establishment of asectoral baselines and the aggregation into a multi-sectoral baseline, potential mitigation actions of sectors, national business as usual baseline and aggregated mitigation actions, and the way to select in meeting the national emission reduction target in line with national development priorities. This document also contains a more detailed description on several sectors and subsectors, namely power, transportation and industry as subsectors of the energy sector as well as the waste and land based sector. Capacity building measures need to be based on a capacity development strategy and implementation plans that ensure the balanced and sustainable growth of the national and local renewable energy sector. The Capacity Development Needs Diagnostics for Renewable Energy (CaDRE) helps policy makers, organisations and capacity development/renewable energy practitioners shape an environment conducive to the development of renewable energy. CaDRE is designed as a country-driven, comprehensive approach to analysing the capacity already in place, predicting future capacity needs, identifying capacity gaps and providing recommendations for creating capacity development strategies. It is based on the guiding principle that no successful capacity development strategy can be built without intensive stakeholder engagement. This Handbook and Toolbox provide modular guidelines and practical tools for planning and completing a comprehensive diagnostic of the energy landscape. 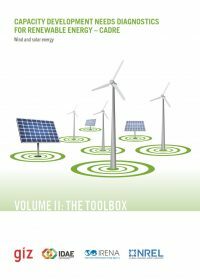 They also supply the tools for conducting an analysis of capacity gaps related to solar and wind energy targets.